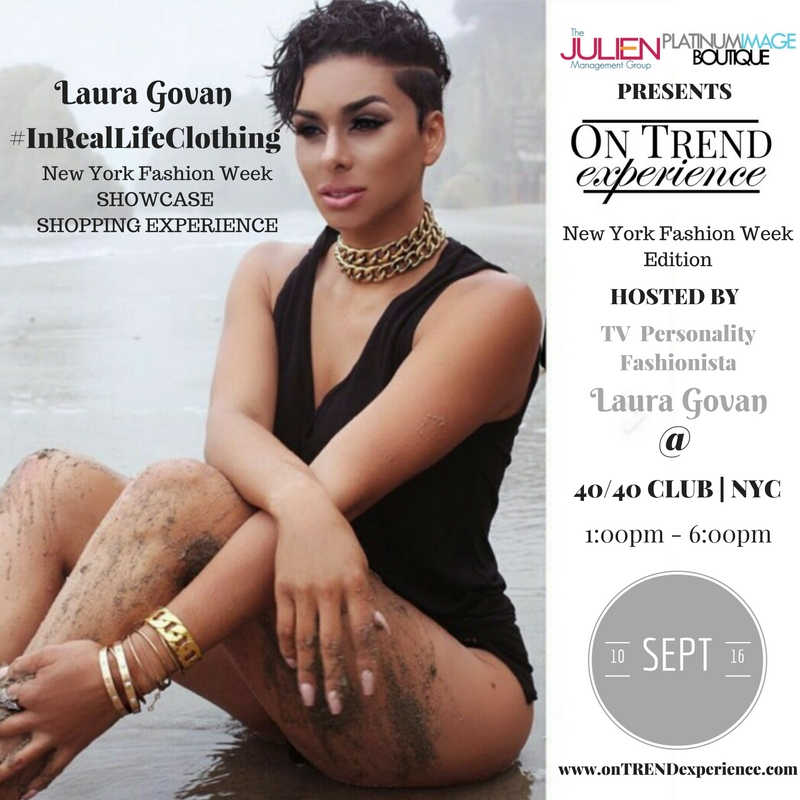 The Julien Management Group and Platinum Image Boutique Presents On TREND Experience | New York Fashion Week Edition hosted by TV Personality & Fashionista Laura Govan taking place Saturday, September 10, 2016 from 1:00pm - 6:00pm at the luxurious 40/40 Club in New York City (sorry, this is an invite only event; or contact them for tickets). The On TREND Experience | NYFW Edition is an event that will allow the hottest trending and emerging designers, boutiques, brands and others the opportunity to promote and showcase to their respective market of professional TRENDERS during the most fashionable week in New York City. TV Personality and Fashionista Laura Govan recently launched her #InRealLifeClothing to huge buzz and trending notoriety not to mention sales! During NYFW at the #onTRENDexperience, Govan will host a showcase & shopping experience highlighting her #InRealLifeClothing line. She will also host a "Style Experience" tutorial for limited guests during the 1pm-2pm hour of the affair. Tickets for her "Style Experience" with notable Celebrity Wardrobe Stylist Daniel Hawkins are available on www.OnTrendExperience.com. Daniel Hawkins has emerged as one of the hottest and brightest Celebrity Wardrobe Stylists in the entertainment game. His work speaks monuments and undoubtedly magnifies the "style brands" of fashionistas entrusting him to execute their desired looks. From Tamar Braxton, Nene Leakes, LaLa Anthony, Fantasia and Laura Govan to name a few, Daniel Hawkins' visionary style continues to make its mark on red carpets and publications editorials as one of the best in the business. Daniel will join #InRealLife Client Laura Govan as they host a "Style Experience" tutorial for limited guests during the 1pm-2pm hour of #onTRENDexperience. Tickets for the "Style Experience" or general admission is available on www.OnTrendExperience.com. Celebrity Makeup Artist Carlos Martinez is bringing his legendary face beat services and brand to #onTRENDexperience. Known for his lip game and overall creative beauty skills, Martinez continues to be in high demand by some of the entertainments best! Honorable mentions include Claudia Jordan and Melyssa Ford in addition to his editorial and Creative Director work with other celebs and brands too numerous to mention. Martinez will be taking appointments for face beats and makeovers at #onTRENDexperience in fabulous OTE Glam Suite. You can make your appointment with Celebrity Makeup Artist Carlos Martinez by emailing LOSO.MUA@gmail.com. For general admission tickets visit www.OnTrendExperience.com. Shoe Designer Stella Hues has exclusive authority as the only other shoe designer besides Christian Louboutin that boasts their own patent for colored sole pumps. The brand is known for its collaborations with Designer Michael Costello's Fashion Week Shows and has provided footwear that has undoubtedly elevated the designer's pieces. Stella Hues will participate in #onTRENDexperience providing a showcase and shopping experience of some of the brands hottest women's shoes. Jada Pinkett Smith & J Lo are just two of the designers favorites that has worn the Stella Hues brand. For general admission tickets visit www.OnTrendExperience.com. Brazilian Swimwear Designer A.Z Araujo is one of the hottest women's and men's swimwear designers. His pieces have been showcased several seasons during NYFW and the brand continues to permeate the world of swimwear design. His notable clients include Laura Govan, Adrienne Bailon, Porsha Williams, Matt Barnes & Cleveland Cavaliers NBA player Iman Shumpert. A.Z Araujo swimwear is participating in #onTRENDexperience and will entice guests with a showcase and shopping experience highlighting some of the brand's sexiest swimwear pieces. Visit www.OnTrendExperience.com for general admission to experience A.Z Araujo. Visit www.AZAraujo.com to check out their amazing swimwear line. For general admission tickets visit www.OnTrendExperience.com. Platinum Image Boutique is an online trending boutique that has the most fab celebrity inspired fashions for affordable PLATINUMistas. From their Wardrobe Styling to their exquisite pieces which have appeared on red carpets, music videos and many notable platforms solidifying Platinum Image Boutique's #onTREND status. Get your tickets to Platinum Image Boutique's showcase & NYFW shopping at #onTRENDexperience. Check out their fashionable selection at www.PlatinumImageBoutique.com. For general admission tickets visit www.OnTrendExperience.com. Author Takisha Payne will have her hip yet inspirational children's book...Bitsy Bop Wants to Hippity Hop. Bitsy Bop is about a small child understanding and using her GOD given talents. With the encouragement of her father and her focus she excels in her passion...Hip Hop dancing. This book is for children of all ages and can be purchased at #onTRENDexperience. The DJ providing the music soundtrack for this #onTREND event is Celebrity & Fashion DJ Erick Faria who is known for his hip, uptempo house sets that warrants all #TRENDERS to want to walk a runway! Jesse Queen Designer Bianca Stewart will be showcasing her fashions at #onTRENDexperience! Come and get a taste of whats #onTREND! Celebrity Wardrobe Stylist Joe eXclusive will be at #onTRENDexperience for a Meet & Greet! See why his celebrity clients such as Keyshia Cole, K Michelle and SO many others and why he's always #onTREND He will also be presenting one his clients Royalty by Kieu and her fabulous fashions. Celebrity Eyewear Designer Corey Woods will be featuring an exclusive SPECIAL at #onTRENDexperience and all of his fashions will be $40...$40/$40! Corey is #onTREND for his unique eyewear as seen on Queen Bey, Amber Rose, Christina Milian and so many others!